Queen Elizabeth stamps have been issued by many different countries around the world. As reigning monarch, they are on all of the stamps issued by Britain. Because of the length of her reign, there is a wide variety of Queen Elizabeth stamps. Queen Elizabeth stamps are widely available and can make an interesting topic for stamp collecting to monitor her fortunes over recent history. Like all areas of stamp collecting, it important to ensure you get good value for your cash when buying Queen Elizabeth stamps. EBay has many Queen Elizabeth stamps deals at competitive prices to make your stamp collecting dollar go further. EBay is one of the largest and most trusted websites on the Internet today. Queen Elizabeth stamps have been issued since the Queen's accession to the throne in 1952 up to the present day (March 2011). She appears on every British stamp issued since that date on all the definitives and commemoratives stamps. Britain is the only country that does not have its name on its stamps; instead, it has the image of the reigning monarch. Although, it recently appeared as though her image may disappear from British stamps, as the British government looked at privatizing the Royal Mail, but that loophole has now been closed. In the first 15 years, the image of the Queen used on the stamps was from a photo taken by Doris Wilding. Since 1967, the image is the classic designed by Alan Machin. 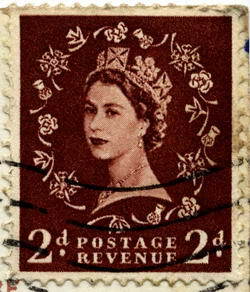 In 1953, for the Queen's coronation, four stamps were issued by Great Britain to celebrate this event. The stamp face values were 4 d, 2 1/2d, 1/6, and 1/3. A stamp album with 105 stamps, including the four British stamps celebrating the coronation, recently sold for £75. The stamps were mint condition and lightly hinged. As well as being on all British stamps, many countries of the commonwealth regularly issue Queen Elizabeth stamps including India, New Zealand, Canada, Singapore, Australia, etc. The video above shows a selection of Queen Elizabeth stamps from Australia before they changed over to dollars and cents as their currency.